During the Mid-Autumn Festival, cultural stations are held in each of our classrooms. The students are provided a variety of opportunities to understand and talk about this very important traditional festival in China. Students alternate between stations, lead by parent volunteers, where they make moon cakes, learn legends and stories about the festival, and experience traditional activities that Chinese people do for Mid-Autumn Festival. With each station, students are given opportunities to have fun while applying the target language – another powerful way of learning language and culture through fun and entertaining activities! During the Spring Festival (Chinese New Year) Celebration Week, students will experience one or several Spring Festival Traditions each day. Activities include couplets writing, paper cutting, calligraphy, making lanterns, making dumplings, participating in a reunion meal, learning the new year greeting and receiving red packets. To celebrate as a community, our Chinese New Year Celebration features faculty lead performances from our students as well as other guest musicians and dancers, showcasing Chinese history, culture and customs. Our celebration is open to family, friends, and the public. Our students have also been invited to participate in various Chinese New Year Celebrations throughout the Portland metro area. Celebrations include performances at Washington Square Mall and the Portland State University Chinese New Year Gala. Starting in 2016, our 4th grade students participate in a “Community Conversation” event. 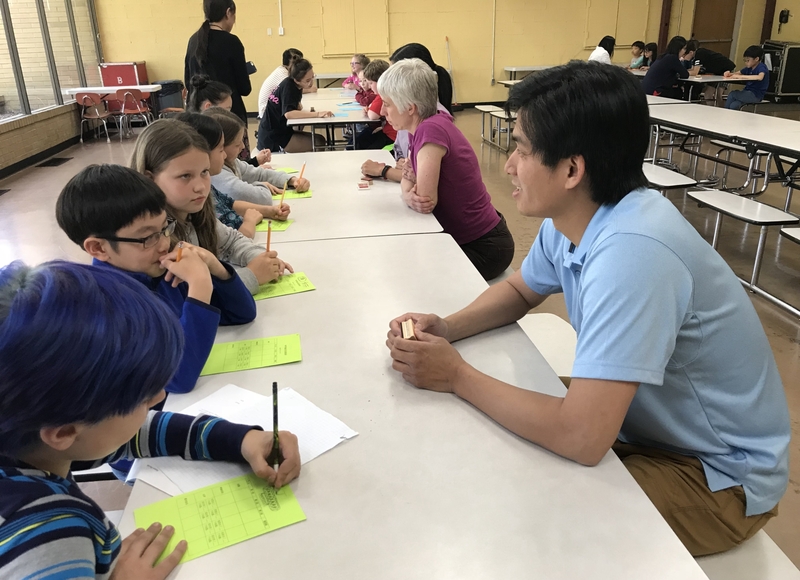 This outreaching academic event provides an authentic community platform for the students to practice their interpersonal communication skills in Chinese prior to their 5th grade Milestone China Trip. Chinese native speakers from the Intel Corporation, Portland State University graduate programs, and Confucius Institute are invited as guest speakers to HCCS and hold multiple rounds of conversation with the 4th graders based on several assigned familiar topics, such as food, family, holidays and travel. The students are divided into small groups to keep all the students engaged in the conversation all of time. The participating students also have tasks to complete while conversing with our guests in Chinese. Each student asks and answers at least 3 questions to and from the guests they talk to. In each round of conversation, there is a secret word hidden in the guest’s talk. Guests find ways to repeatedly use their secret words in conversation while students listen carefully to identify the secret words.